You are here: Home / Weekly Columns / Opinion / Which of the Samsung flagships should you buy? Which of the Samsung flagships should you buy? (ThyBlackMan.com) This year is shaping up to be a big one for smartphone launches, especially for Android fans. Apple is also rumored to be working on some very big features, but when compared with Samsung flagship phones, Apple is still behind the South Korean company in terms of design and innovation. Last year’s Galaxy S9 and Galaxy S9+ were not the best smartphones and they couldn’t live up to the hype. Interestingly, this year Samsung launched the Galaxy S10 series and almost addressed all the issues people had with the previously launched Galaxy smartphones. The Samsung flagships of 2019 are a lot more interesting than expected. Samsung has launched four Galaxy S10 models with some changes in design and various hardware specifications. Given the quantity of these new smartphones, it’s hard to pick a winner, so we have done this tough job for you. When Samsung decided to redesign its new smartphone, the company chose the best possible way to make its flagship phones stand out. The screen-to-body ratio has been changed in a very positive way. Last year’s Galaxy S9 disappointed many fans as it had larger bezels. The new Samsung Galaxy S10 has a lot better display that offers more screen space. The front-facing cameras on these phones also sit behind the screen – also called “punch-hole” display. Instead of a notch, this new trend is set to peak in the coming months. Samsung has introduced five smartphones out of which four belong to the Galaxy S series. These devices are S10e, S10, S10+, and S10 5G. The Galaxy S10 and S10+ are available for pre-order. The S10 features a 6.1-inch display while the S10+ has a 6.4-inch display. Both the smartphones feature the same three rear cameras, but their front cameras are different. The Galaxy S10 features a single 10MP front-facing camera, but its big brother, the S10+, offers dual 10MP + 8MP front-facing cameras. Big screen phones need high battery capacity and it’s the same case with the Samsung Galaxy S10+. The smartphone has a 4100mAh battery, while the Galaxy S10 comes with a 3400mAh battery. Both the phones have a fingerprint sensor built into the display. For fingerprint reading, these smartphones use ultrasonic technology which is superior to the fingerprint sensors Samsung added to the previously launched phones. On the S9 series phones, fingerprint sensors were on the back panel. Samsung has also launched the S10e and S10 5G phones. On the S10e the fingerprint sensor is at the power button. The company has not revealed all the details about the S10 5G, we expect the phone to feature an in-display fingerprint sensor. The Samsung Galaxy S10e is not as expensive as the S10 and S10+, but it still has a premium price tag of $749. The phone has a smaller 5.8-inch display, two cameras on the back and a front facing-facing camera of 10MP. Like other Galaxy S10 series phones, the S10e also runs on Snapdragon 855 chip and is powered by a smaller 3100mAh battery. The Samsung Galaxy S10 5G phone is not currently available for sale, but Samsung has shared some details about this new 5G phone. The Galaxy S10 5G will sport a 6.7-inch display, triple-lens (16MP + 12MP + 12MP) rear cameras and a 10MP front-facing camera. It also has the biggest battery in the S10 series phones. According to Samsung, their new 5G phone will have a 4500mAh battery. 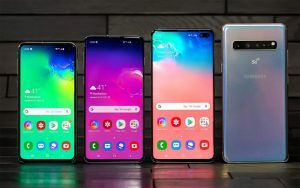 For now, Samsung’s S10 and S10+ are holding strong and it’s all because of the company’s talented designers and engineers who perfectly blend the latest hardware, innovative features, and beautiful design. But, in the way Samsung is making quick advancements to their smartphone’s network technology, the new lineup of phones is getting more interesting. If you can afford to wait for the 5G handset, we suggest doing so. If you already have a budget in mind, let the price drops hit the previously launched phones, because if you compare the new phones with the Galaxy S9, the S9 series is still very powerful.